The artwork manages to keep the 'feel' of the original Watchmen using very uniform panels and a low colour pallet while taking advantage of more modern artistic staples including the superior printing techniques we are now very accustomed to (not grainy and newspaper like the Watchmen book that I know so well.) The story is not told or crafted but recounted in a loving way that shares much with Alan Moore's own early style. The characters through all only appearing in the issue for a about a page each as they are listed and remembered by a retired Night Owl are individual and distinctly recognizable. 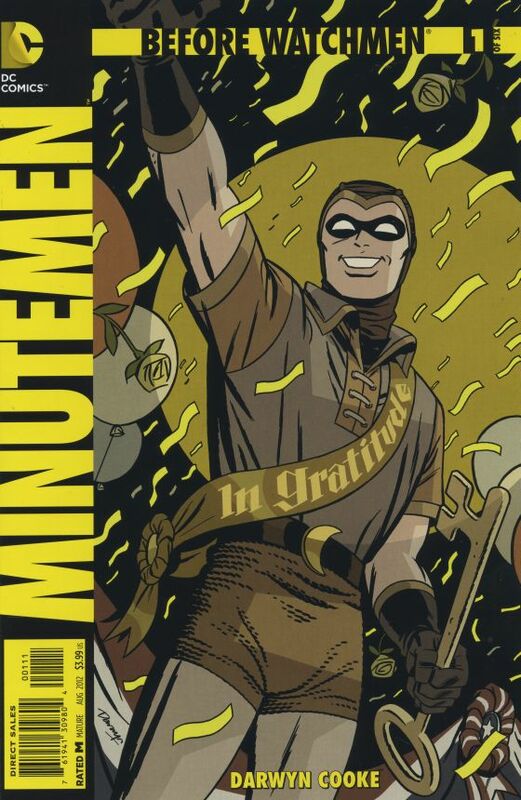 It looks like the story is going to follow the formation of the Minutemen from the very start (as we all expected I think) and it's a story that as much as I protested I do want to read. We are even treated to some glorious pirate imagery at the end to kick off what looks to be a wonderful series.